When I start to go back and forth between something it is a sign that I am alternating two wrong approaches. I’ve been having such issue with several sites that are interesting enough to check often, but not valuable enough to check too often. Yes, Twitter is one of them, but there are couple others. Keeping them open wastes time. Opening when needed also wastes time. Solution is to minimize time it takes to open. So I poked Opera interface several times and tinkered something fitting out of main bar (one of toolbars). 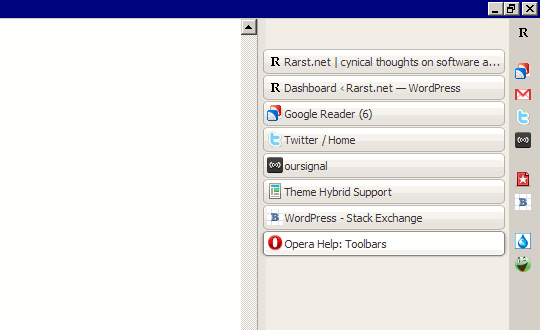 Main bar is one of those Opera toolbars that ended up on the sideway. It is remnant of times when browsers had a lot of buttons. Main bar hosts such “important” buttons as save page or tile windows. Yawn. So we will be scraping those and repurposing main bar into killer lightning fast bookmarks bar. better than bulk folder open (easier to access, easier to open selectively). curiously it doesn’t react to middle click (which I use as faster Ctrl+Shift+Click). it is synced by Opera Link. For me deal breaker was that for some weird reason it doesn’t support spacers. Searches and folders don’t work well in vertical bar anyway so I went with main bar. Otherwise personal bar is very valid alternative for almost identical result. For a small slice of screen you get very fast way to open sites. I use Opera for years and it still amazes me how flexible interface is and how far you can push it to save your time. Is it time to move browser tabs to the right? I use the status bar for the same purpose. It seems to have the same advantages that you have mentioned for the main bar. Am I wrong? 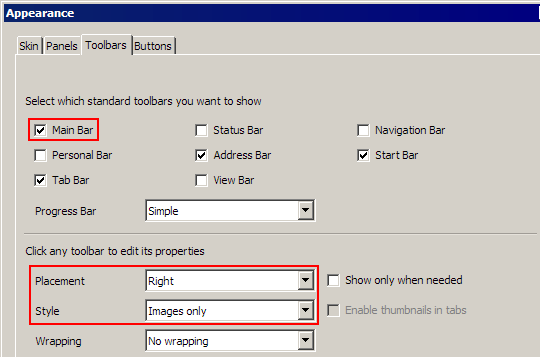 Most of Opera toolbars have similar mechanics, it is personal bar that is slightly different. Status bar actually does something useful (even if I don’t use it myself). Main bar is useless relict. I’ve read that next major release (likely 10.70 or so) will have new bar to replace personal bar. Will be interesting how they do it.